In July 2015, when Special Agent Paul Zukas began his first day on the job at the FBI legal attaché office in Warsaw, Poland, little did he know his initial case would involve helping the country’s Ministry of Culture and National Heritage recover a treasured painting allegedly looted by Nazi soldiers during World War II. Zukas’ deep appreciation for art, history, and culture would be his guide during the Bureau’s two-month investigation, which ultimately led him to an Ohio couple who had purchased the painting in question—unaware that it may have been looted. Poland’s National Museum in Warsaw had been home to Polish baroque painter Krzysztof Lubieniecki’s Portrait of a Young Man, completed around 1728. The painting—along with other artwork—purportedly had been taken by the Nazis circa 1944 and placed inside a palace in Austria before seemingly disappearing. A possible clue about the missing painting surfaced in August 2009, when Bob Wittmann was leafing through an old stack of family photographs at his home in Detroit. Wittmann had been conducting research on his late father’s World War II service record when he came across a picture taken in 1945 of then 19-year-old Private John Wittmann in full service dress. The soldier was posing in uniform in his Columbus, Ohio home alongside a number of wartime mementos he collected during his time abroad. An inventory label from Poland’s National Museum on the back ofPortrait of a Young Man provided a clue about the painting’s rightful owner. The photograph showed an old painting that Bob Wittmann recognized from childhood depicting a young man wearing a light blue coat and powdered wig. Wittmann also found a second photograph of the painting, which featured an inventory number and a phrase in a foreign language he didn’t understand. Intrigued, he searched for the phrase on the Internet and landed on the website of the National Museum in Warsaw. Wittmann later discovered a painting that looked like the one his father brought home from the war had been reported missing by the Polish government. He eventually notified Poland’s Ministry of Culture and National Heritage about the missing painting and agreed to assist them in tracking it down, thinking it could still still be in his family’s possession. Wittmann’s search ended after he learned a relative in Florida sold the portrait through a third party to an Ohio art collector with the last name Bobb around 1990. The Polish government then turned to the FBI for help, and that’s where Zukas came in. After poring over his newly assigned case file, Zukas learned about Wittmann through all the correspondence he already had with the Polish government. “I knew about all the key players based on Bob Wittmann’s extensive research and simply had to put the pieces together,” he said. Zukas picked up the phone and called John Bobb, the possible owner of the painting. Following their discussion, Bobb realized that the painting the FBI was searching for could be the same one hanging on his dining room wall in Westerville, Ohio. In August 2015, Bobb e-mailed a photograph of the painting to Zukas, who knew instantly it was a match. But was the painting authentic? That September, Bobb and his wife, Janis, brought the portrait to the FBI’s Columbus Resident Agency—a satellite of the Cincinnati Field Office—where they met with a member of the Bureau’s Art Crime Team and officials from the Polish government. After a series of careful examinations, it was confirmed the painting in John and Janis Bobb’s possession was indeed Portrait of a Young Man. An art expert from the Polish government authenticates Portrait of a Young Man against a copy at the FBI’s office in Columbus, Ohio. 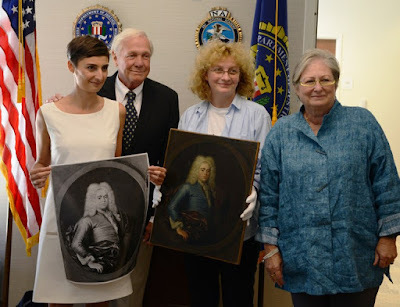 Although the Bobbs had to bid farewell to the painting, the FBI invited them and Polish government officials to attend a rededication ceremony at the National Museum in Warsaw last fall. There they were joined by Wittmann and his wife, as well as Zukas, to witness Portrait of a Young Man officially returned to its rightful place. “Seeing the painting unveiled and back at the museum was an incredible feeling. It was the single best moment in my FBI career,” said Zukas.